A room full of nurses and leaders at Emory University Hospital share their excitement when they hear the hospital has received Magnet recognition for nursing excellence for a second time. 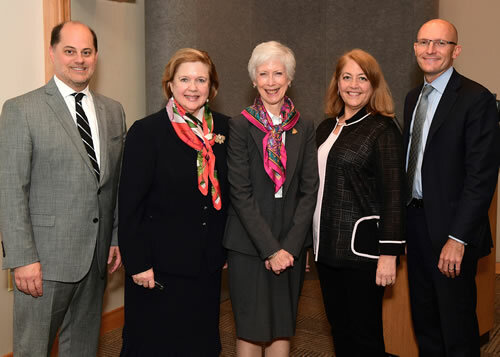 Emory University Hospital (including Emory University Hospital at Wesley Woods) has received Magnet recognition for a second time, a testament to its continued dedication to high-quality nursing practice. The American Nurses Credentialing Center’s (ANCC) Magnet Recognition Program® distinguishes health care organizations that meet rigorous standards for nursing excellence. This credential is the highest national honor for professional nursing practice. Hospital and Emory University Hospital at Wesley Woods. The Magnet Recognition Program administered by the American Nurses Credentialing Center, the largest and most prominent nurses credentialing organization in the world — identifies health care organizations that provide the very best in nursing care and professionalism in nursing practice. The Magnet Recognition Program serves as the gold standard for nursing excellence and provides consumers with the ultimate benchmark for measuring quality of care. For more information about the Magnet Recognition Program and current statistics, visit www.nursecredentialing.org/magnet. Emory University Hospital (EUH) was founded in 1904 as Wesley Memorial Hospital, with 50 beds. Today, EUH has 733 licensed beds, including 82 beds at Emory University Hospital at Wesley Woods. The teaching hospital is well-known for its specialties in cardiology and cardiac surgery; cancer; brain health services (neurology, neurosurgery and psychiatry), transplant and more. It is staffed by more than 1,450 Emory faculty physicians and over 4,000 employees. In 2014, the first patients treated for Ebola virus disease in the U.S. were cared for in the hospital’s Serious Communicable Diseases Unit. EUH is a Magnet hospital, a designation earned by only seven percent of U.S. hospitals for nursing excellence. In 2018, U.S. News & World Report again ranked EUH the No. 1 hospital in both metro Atlanta and Georgia.